git is a distributed revision management system. To former users of centralised version control systems, it initially seems rather complex to use. But, as is often the case, it is also much more versatile and powerful. In order to remember – and instruct others – which commands transfer code between which of the many storage spaces, I created the following cheat sheet. It is slightly inaccurate in some things. 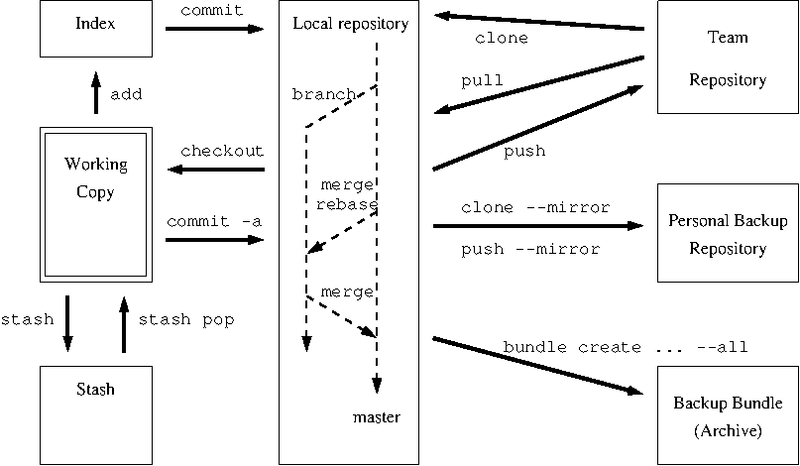 For example, git pull updates the working copy as well as the local repository. But it gives an overview of the most frequently used commands and of some uses other version control systems do not support. I put the diagram above in the public domain. Click on it for a scalable and editable SVG version, or get the original xfig diagram.